Manchester United managed to record a landslide victory while they are undergoing match against FC Midtjylland. They won with a score of 5-1 to qualify for the last 16 of the European League. When they are undergoing the 2nd leg match at Old Trafford, MU wins to catch up the aggregate, which is not easy. In the first half, they were made misgivings. MU is playing dominant, conceding a goal of Pione Sisto in the 27th minutes. The pressure of MU finally paid off five minutes later thanks to an own goal by Nikolay Bodurov. Manchester United failed back ahead in the first half after a penalty Juan Mata could be pushed over by goalkeeper Midtjylland, Mikkel Andersen. MU is noted ESPN can etch 71 per cent possession, 25 times the release experiment, nine on target, could add four goals in the second half. Marcus Rashford becomes a football star with two goals that he makes. They are also equipped with the additional goals from Ander Herrera and Memphis Depay. The match in the second round there is also a red card for Andre Romer. With this victory, Manchester United through to the last 16 of the European League with aggregated 6-3. Before the start, Manchester United gets one loss. Anthony Martial injured that is why he could not play. Louis van Gaal was put Rashford as his successor. Van Gaal's decision made a sweet fruit at the end of the game. The first chance for United came in the fourth minute. The long distance kicking of Memphis could still be blocked. The same fate also experienced by Rasford. His shot from inside the penalty box can still be blocked. Memphis was spreading threats continuously with his kicks of the distance away. He received a pass from Daley Blind in the 17th minute, then he can release the kick from the left side of the face of the penalty box Midtjylland is already on target but could be anticipated Mikkel Andersen. Because of MU was busy with the attacking activity, MU even conceded in the 27th minute, Pione Sisto scored a goal that is similarly a goal in the 1st leg. He broke through the ranks of thy defender, and he can conquer Sergio Romero. MU can be equalized quickly. The goal was registered in the name Nikolay Bodurov, it was an own goal. He made a wrong anticipation of a Memphis cross bait from the left wing. MU had a chance to excel in the final minutes of the first half. Ander Herrera was violated by Andre Romer in box 16 meters. The referee pointed to the spot, but the ball could be blocked by Andersen. Soon the game enters a pause. The second half began; MU continues to confine the defense of Midtjylland. However, attacks that rely on the wing side could be countered because the players of the Denmark representative team lined up in the penalty box. Attempt to score finally could be realized in the 63rd minutes. The goal was scored from the foot Rashford. Mata sends pull bait, which can be solved by Rasford with a hard kick in the penalty box. 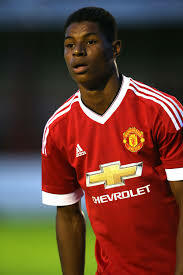 Rashford added another goal in the 75th minute through the cross bait from Guillermo Varela ball can be met appropriately by players who are on the face of goal Midtjylland it. Then, the ball plunged rapidly into the goal. MU did not relax their attacks; they get another penalty kick in the 85th minutes. Kian Hansen got handball while he blocked the ball kicked Memphis, the referee pointed to the spot. For this time, Herrera could perform a good job. Manchester United was leading 4-1. As the game entered the 89th minute, Midtjylland have to play with 10 men. Andre Romer got a second yellow card for pulling clothes Memphis. MU was able to add another goal in the closing minutes of the second half. Memphis finally succeeded in kicking distance away. Kick right-footed from left side of penalty box face Midtjylland came rushing into the goal. Shortly after the match finished, Manchester United through to the top of 16 with a convincing 6-3 aggregated. MU: Romero, Carrick, Blind, Varela, Riley (Rojo 79), Schneiderlin, Memphis, Mata, Herrera (Poole 89), Lingard (Pereira 86), Rashford. Midtjylland: Andersen, Hansenm Bodurov, Romer, Novak, Sparv, Polsen, Olsson (Pusic 79), Sisto, Hassan (Kadlec 67), Urena (Onuachu 46).